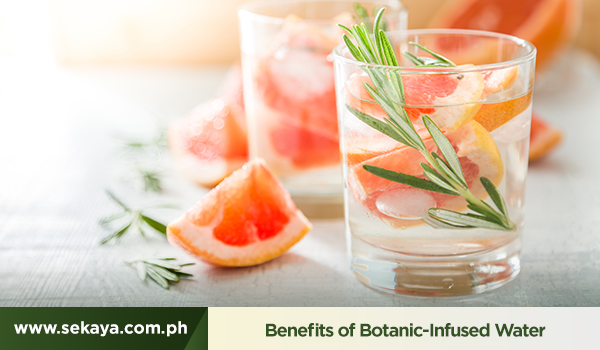 If you’re looking for a healthier alternative to the usual sweetened juices and softdrinks, botanic infusions may be just what you’re looking for. What healthy and refreshing benefits does getting in the habit of drinking botanic-infused water bring? Read on to learn more about botanic infusions. In many readings present online, you’ll find that botanic infusion refers to both method and product of infusing water with the essence of fruits, herbs and other botanicals. But while it may sometimes be called herbal tea, botanic-infused water is technically not tea. Green tea, black tea, white tea and oolong tea—these old favorites are the only real teas, as these are leaves coming from the tea bush (or Camellia Sinensis), processed differently. While botanic infusion may not be your traditional cup of tea, these drinks pack an ensemble of body-empowering benefits of their own. In a nutshell, botanic-infused water aids the body’s self-healing functions with the natural benefits of herbs and other botanicals. Depending on what natural ingredient you go for, drinking botanic-infused water provides the following benefits for your wellness. With ingredients from USDA certified farms, Sekaya Botanic Infusion uses 100% organic botanicals in every blend. These are carefully-picked and studied to provide for your body’s daily healing and empowering needs. Sample nature’s nurture with a recharging pause and a cup of Sekaya Botanic Infusion.